I’ve tried for years to create the effect of fuzzy haloes around stars to pop out the brighter stars and make the constellation pattern more obvious. It’s the “Akira Fuji” effect, named for the ace Japanese astrophotographer who has long perfected the technique with beautiful and widely-published results. I’ve tried various soft focus and diffusion filters, scratched UV filters, vaseline-smeared filters, breathing on filters, etc., etc. None have worked well. Till now. The Kenko “Softon” filter offered by Hutech Scientific works fabulously well! It’s a tough filter to find in local camera stores here — but Hutech sells it. And it really changes the way I do constellation shooting, making any previous shots obsolete. I take several shots without the filter then one or more of the same exposure with the filter in place. I stack the two types of exposures in Photoshop, with the fuzz-filter layer blended with a Lighten mode to a varying opacity to “dial in” the level of fuzziness that looks good. Too much and it looks overdone and fake. 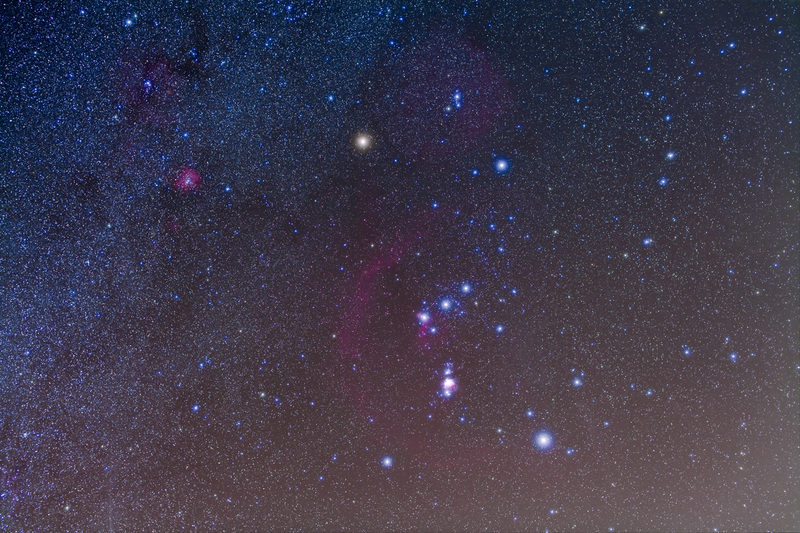 The technique also pops out the star colours, like here on red Betelgeuse amid the blue-white stars of Orion. This was from January 2011 from my backyard and is a stack of four 5-minute exposures w/o filter and one with. All with the Canon 5D MkII and 50mm Sigma lens, a terrific combination for constellation portraits. 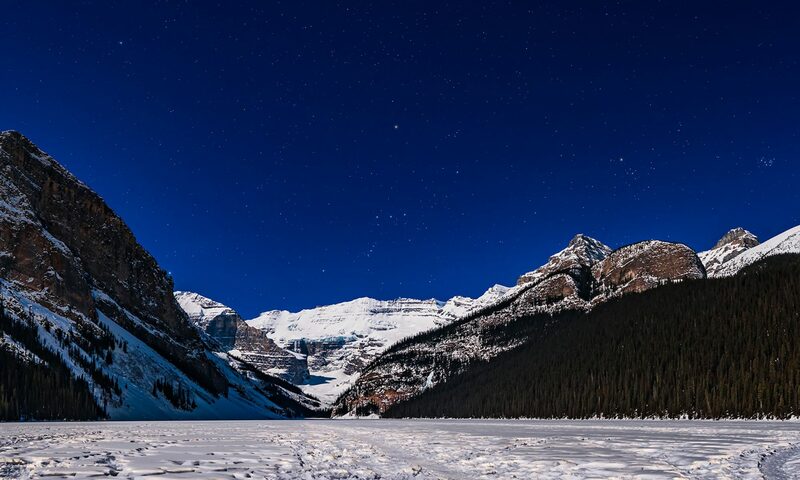 What 50mm lens did you use for this shot? Seems sharp with little coma. Hi – I use the Sigma 50mm f/1.4 EX, not the newest version just introduced. Do you use the Kenko PRO1D Softon Type-A, or just PRO Softon Type-A ? What’s the difference? Hi Mine is the PRO1 Digital and I have no idea what the difference is. It may be the coatings? It looks like the same filters are sold in North America under the Hoya brand name. I’m told the Tiffen Double Fog 3 also works well. I’ve not used it. Tracking isn’t the only thing. I stumbled upon this page cos I was tracking, taking pictures under dark skies but then the brightest stars didn’t stand out cos all other dimmer stars start to shine brightly. So I may consider this filter to have the brighter stars stand out from the rest without under exposing. Living in Japan, hopefully the Kenko Softon shouldn’t be hard to find. I found Cokin diffuser filter works fine. A Cokin system uses square filters with threded filter holders for the lens. You can have multiple holders for your lenses and just slide the filter in place – no need for threading them on in the dark. 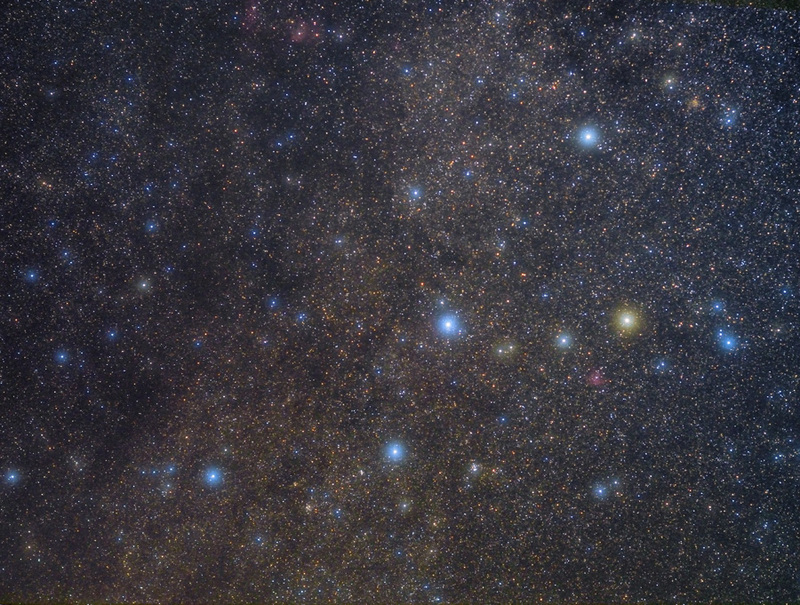 Here’s my first test image, Cassiopeia: http://www.astrobobo.net/wordpress/wp-content/uploads/2009/11/Cassiopeia.jpg 5x2mi with filter and 5x2min without it. The Cokin square slide-in filters are fine but the holders are thick and vignette very wide angle lenses unless you get the largest and most expensive series. But I use the Cokin system for gradient filters for daytime shooting. The Tiffen double fog filter also is used by some photographers – I’ve not tried it. But many soft focus filters won’t produce enough effect, so finding the right one in a series of often dozens of soft focus/diffusion filters from some brands can be tough. That’s why it’s nice to know exactly what filters people use with success. The camera is tracking they sky — you can’t take images like this unless you are tracking. So it’s no problem taking the filter on and off the lens. Plus in stacking the images, Photoshop aligns them. Nor do you need to refocus, not with a filter in front of the lens, only with filters near the focal plane. Do you thread the Softon filter onto the lens? It seems this would take time and then you’d have to refocus, takes more time, and if not tracking, then everything will have moved.